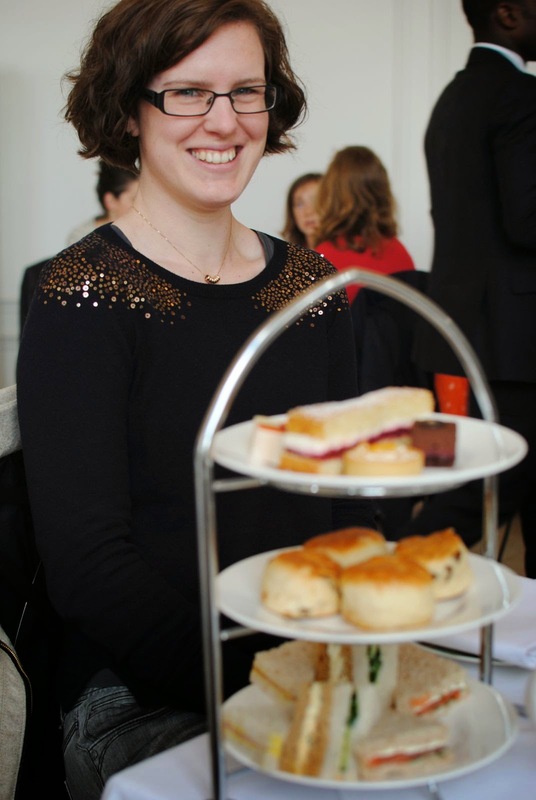 Last Saturday we visited Kensington Palace for a look around and to use the afternoon tea voucher that I'd been given to Christmas. 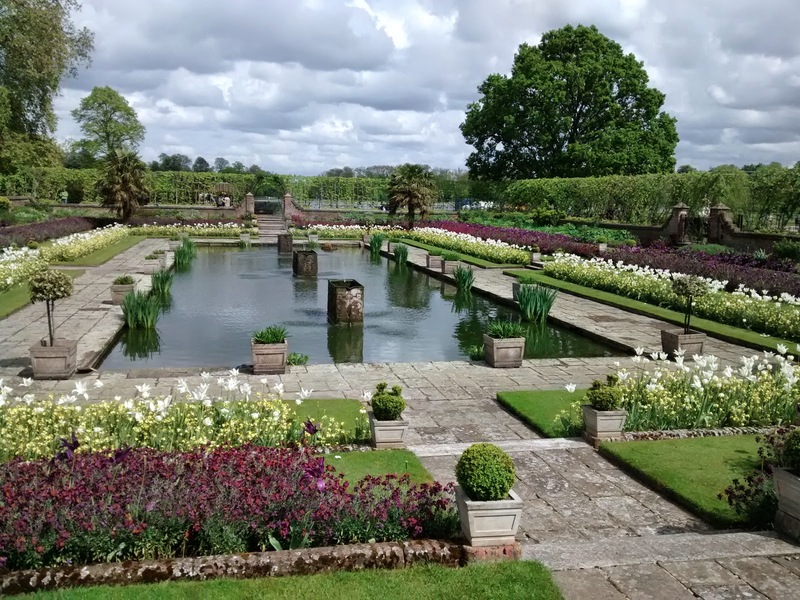 As we arrived we walked past the sunken garden which was looking resplendent in the sunshine that was trying to break through the clouds above. After taking a quick photo of the garden we headed into the house for a look around. I enjoyed the Palace a lot more than I was expecting. Largely empty of furniture they've set up the large rooms as spaces that you can enjoy. In the King's apartment there were games tables set up, where Becks and I took the weight of our feet and enjoyed a game of cards. 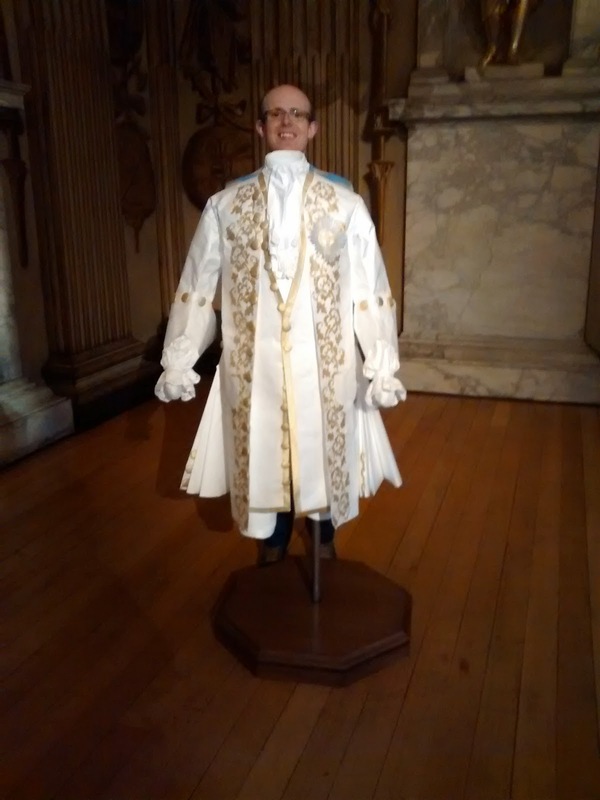 They also had manikins dressed up in 17th / 18th Century clothes demanded the obligatory photograph. There were two small exhibitions on display. The first was a small dress collection from the Queen, Princess Margaret and Princess Diana. The dresses from the 1950s & 60s were incredibly stylish. Princess Diana's dresses from the 1980s looked dated on the manikins, but in the photos of her wearing them she could definitely pull them off even today. We had to rush slightly through the Queen Victoria exhibition as we were late for our afternoon tea. I was left wishing I knew how to dance as they were playing the waltz in one of the galleries and I had the strange urge to go for a twirl! We rushed over to the Orangery for our afternoon tea. The Orangery was a great space with incredibly high ceilings and lots of sun flooding into the room as you'd expect. The first thing I noticed were Royal Palace tea plates, that were a beautiful design and perfect for the location and setting. Once we'd ordered our teas they arrived reasonably quickly and we had a decent selection of sandwiches, a plain and fruit scone and cakes. The tea was solid, rather than exceptional, and the service was a little inattentive, but it is the type of place where you go for the location and the setting more than anything else, and on those scores it did well.